Search-driven analytics platform KnowledgeHound needed content to support the launch of their new product that would not only raise awareness but generate leads. When KnowledgeHound approached us to help support their new product launch, we proposed a white paper around the theme of ‘the challenge in communicating insight to a wider audience’ with commentary from our friends at Twitter, Coca-Cola and Kadence International. 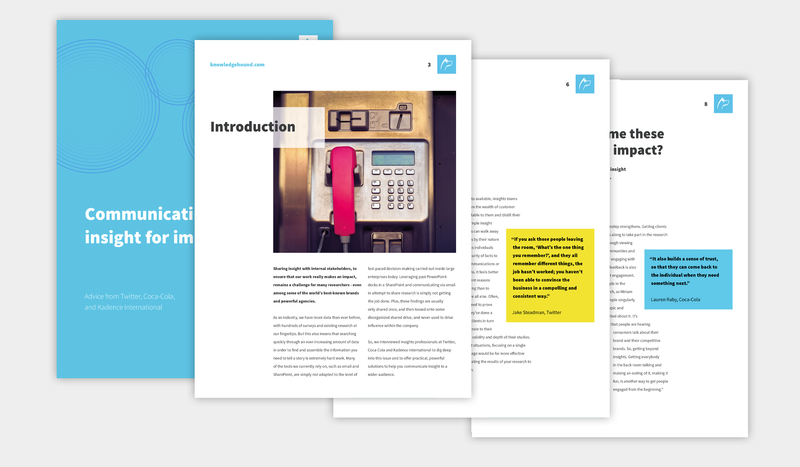 We set up and completed the interviews, then used the insights to create a professionally-designed, downloadable white paper on how to ensure your data has impact, using KnowledgeHound’s distinctive style and branding. We also created two further blogs on communicating insight for their website and mailers to support the whitepaper. KnowledgeHound distributed the white paper to their core audience of insight directors at Fortune 1000 companies. The project led to 30 qualified marketing leads.